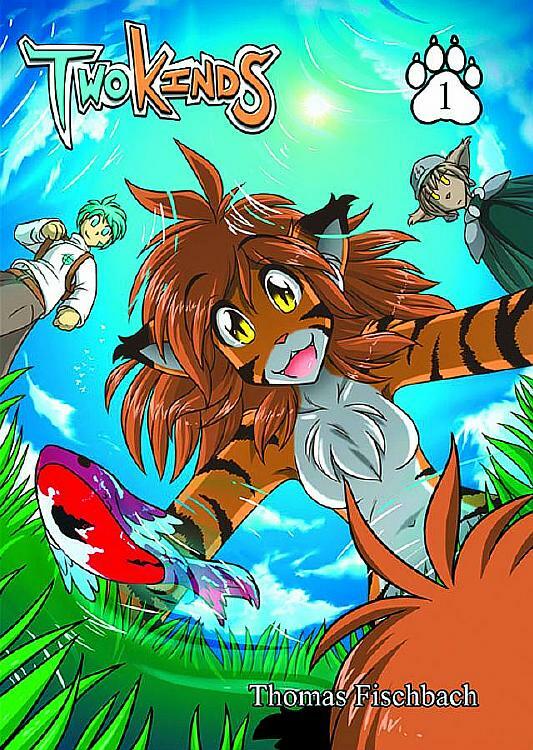 For the first time on printed paper, Keenspot will soon be releasing Twokinds as a pair of full-color graphic novels in trade paperback. This Ursa Major Award-winning on-line comic is written and illustrated by Thom Fischbach. “After waking up without any memory of his past, the lone mage Trace finds himself in the company of Flora, a girl from a bestial species known as the Keidran. Along with a reluctant Basitin warrior named Keith, they journey in search of a place to call their own. But with war between the races brewing, love conflicts with loyalty.” Volume 1 includes a special 5-page epilogue that was not printed on line. Though the release has been pushed back a few times, both Volume 1 and Volume 2 are currently set to hit the shelves this October. You can order them both at the Mile High Comics web site. The Kickstarter drive reached its $25,000 goal in 12 hours, and now stands at $69,581 from 716 backers. 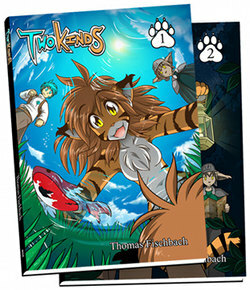 In response, Twokinds artist Tom Fischbach has promised to switch to twice-weekly updates if pledges reach $100,000 in the next 28 days. Update (17 May): Total: $197,513/2,463 backers. Twokinds was voted Best Anthropomorphic Graphic Story in the 2010 Ursa Major Awards, but was not nominated (or declined nomination) this year. The drive is to provide stock for Volume 2, and replace the print-on-demand edition of Volume 1. A wide variety of pledge rewards are on offer, including a map, poster, larger and limited-edition hardback editions, side-comics, digital downloads, sketches and cameo placements.